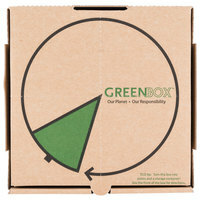 Our selection of environmentally-friendly pizza boxes is made of 100% recycled material! Many options are not only recyclable, but biodegradable and compostable as well, allowing them to decompose with no harm to the Earth. 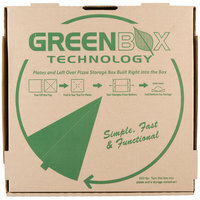 One style of green pizza box is perforated to break down into four plates and a smaller box to store leftover pizza easily in the refrigerator. The smaller pieces are easier to recycle, and the design eliminates the need for paper plates, aluminum foil, and other materials that would end up in the garbage. Also make sure to check out other great items from Choice and GreenBox. 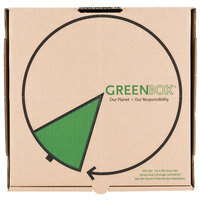 Green corrugated pizza boxes are durable to keep pizzas safe through transport and delivery, and can be easily broken down and recycled when the pizza is gone. Made of recycled material, many of our biodegradable pizza boxes are FDA Compliant and adhere to the standards of the Sustainable Forestry Initiative. For other supplies to use in your pizza shop, check out our pizza stackers, delivery bags, and cutters. If you're wondering where to buy greenbox eco-friendly corrugated pizza boxes, we have a large selection of greenbox eco-friendly corrugated pizza boxes for sale at the lowest prices.